'While China expressed reservations on the Indian role in the South China Sea, Beijing threw to the winds Indian concerns on Kashmir by announcing $46 billion in investments Pakistan occupied Kashmir,' says Srikanth Kondapalli. China's Foreign Minister Wang Yi is visiting New Delhi primarily to prepare the draft of the joint statements by mutual consultations at the G-20 summit meeting in Hangzhou and the BRICS meeting in Goa. Despite the recent stepped-up high-level leaderships visits to each other, India and China are straddled with a number of contentious issues. Both China and India have been cooperating in the G20 process since its inception, mainly in opposing Western trade protectionist measures, for uninterrupted investment flows and restructuring of the Bretton Woods institutions to accommodate the emerging economies. These issues have become acute since the spread of the global financial crisis from 2007 onwards. Apart from deliberating on these, Wang's brief is also to thwart any discussion at the G20 summit on last month's Permanent Court of Arbitration's caustic judgment on the South China Sea issue. The tribunal dismissed any legal validity to China's claims to territories in the region. While China claimed to have garnered the support of over 60 countries for its position on the issue, it has also made efforts to ward off criticism in multilateral fora like the Southeast Asian grouping recently. China intends to divide the G20 grouping on similar lines. Wang will also make a probing mission on the forthcoming BRICS meeting in Goa. While consensus has emerged on a host of issues in the BRICS format such as on multi-polarity, sustainable development, infrastructure development, the United Nations Charter, no regime change in Syria and others, China and India appear to be at loggerheads on the global commons -- maritime, cyber and space domains. Given the democratic nature of the Indian polity, New Delhi had advocated freedom of navigation, no restrictions on cyberspace and no weaponisation of space. China on the other hand had advocated territorial sea, cyber sovereignty and the consequent restrictions on cyber domains and anti-satellite missions. These differences come at a time when emerging economies, except India, are facing acute hardships. More significantly, bilateral relations, instead of multilateral formats, will be the focus areas of Wang's visit. China had been forcing India to accept its controversial version on the South China Sea, with no clear and explicit assurances on the safety of 55 per cent of Indian trade passages through the region. India needs to take into consideration its trade interests and feelings of the countries in the region before making any commitments to Beijing. The Indian Navy needs to deploy contingents to the region on a regular basis. While China expressed reservations on the Indian role in the South China Sea, Beijing threw to the winds Indian concerns on Kashmir by not only announcing $46 billion in investments in infrastructure projects in turbulent Gilgit, Baltistan and Pakistan occupied Kashmir as a part of its China-Pakistan Economic Corridor build-up with Pakistan but also brazenly deploying 'non-combat' security forces in the region. 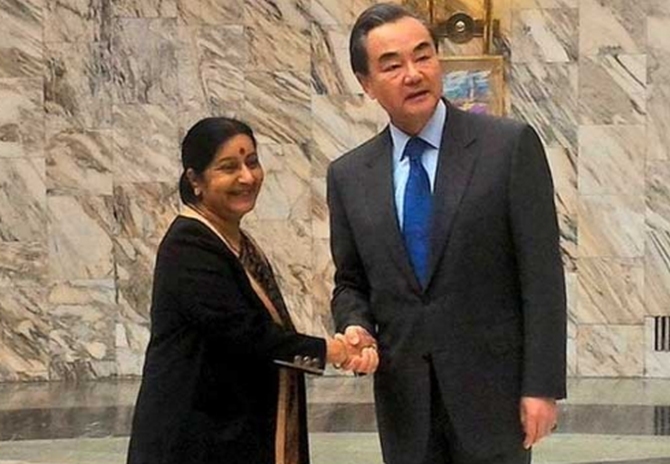 While India all along stated the 'One China' policy, there is no reciprocal understanding on the 'One India' policy from Beijing, despite Foreign Minister Sushma Swaraj's reminder to Wang in May 2014 when the latter came as a 'special envoy' to greet the new government. New Delhi also finds unpalatable China's statements on the recent turmoil in the Kashmir valley -- forgetting for the moment nearly 150 self-immolation protests in Tibet. India needs to protect its sovereignty interests in the entire Kashmir according to the Indian Parliament resolution in 1993. India also needs to evaluate the costs and take appropriate actions on the Bangladesh-China-India-Myanmar forum, the South China Sea and other areas. Also contentious between the two countries is the issue of terrorism. Even though the bilateral statements suggested that India and China both oppose all forms of terrorism and they did conduct five 'hand-in-hand' joint army operations, China's 'technical hold' five times at the United Nations on the terror list has come as a shocker for New Delhi. India needs to convey to China that Beijing is playing with fire. Another issue that divided both countries is India's membership in the Nuclear Suppliers Group. China displayed its obstructionist position at the recent NSG meeting in Seoul by arguing that India has to sign nuclear arms control and disarmament measures and that any waiver for India should not be discriminatory for other aspirant States, meaning Pakistan. In 2008 China finally consented with the United States for such a waiver for India, but it has now been blocking India's membership, throwing to the winds the 'strategic and cooperative partnership' agreement between India and China in 2005. In the next round at the NSG, after India obtained the consent of Mexico and South Africa, China is likely to find itself isolated. In that event China's Plan B is to put a condition for Pakistan's membership in the NSG. However, given the proliferation record between China and Pakistan -- both in the nuclear and ballistic missile fields, in addition to no unilateral declarations on Pakistan either on no first use or moratorium on fissile material production, non-proliferation, international safeguards and inspections -- NSG members are likely to see through this insidious game. Wang will also be confronted by New Delhi with growing the bilateral trade deficit which had mounted to more than $45 billion (about Rs 3 lakh crore) last year in China's favour out of a total trade volume of over $70 billion (about Rs 4.7 lakh crore). While some Chinese have argued that Indian exports will be further curtailed if India resists the Chinese position on the South China Sea, New Delhi needs to take a stronger position on insisting on a market economy status in China under the mutually binding World Trade Organisation rules. Also despite promises of over $4 billion (about Rs 26,800 crore) in investments from China per annum, New Delhi needs to remind Beijing that the actual investment so far since 2014 has not been more than a $1 billion (about Rs 6,700 crore). This calls for more punitive trade measures than concessions. 10 events you just can't miss at Rio Olympics! 10 reasons Rio is the HOTTEST place on Earth right now!